It's like an interactive version of 'Where's Waldo?' with a soothing, intricate aesthetic. Hidden Folks is a deceptive game. It appears simplistic, featuring black-and-white line drawings of industrial plants, dense cities, and forests populated by campers and critters. But, its black lines hide multitudes of secrets: It's an interactive hidden-object game with intricate, animated environments that players on iOS, Apple TV and Steam will soon be able to explore. Players interact with certain aspects of these scenes, tapping to open a garage door and reveal a hidden person inside, or discovering secret words in a tiny letter factory. 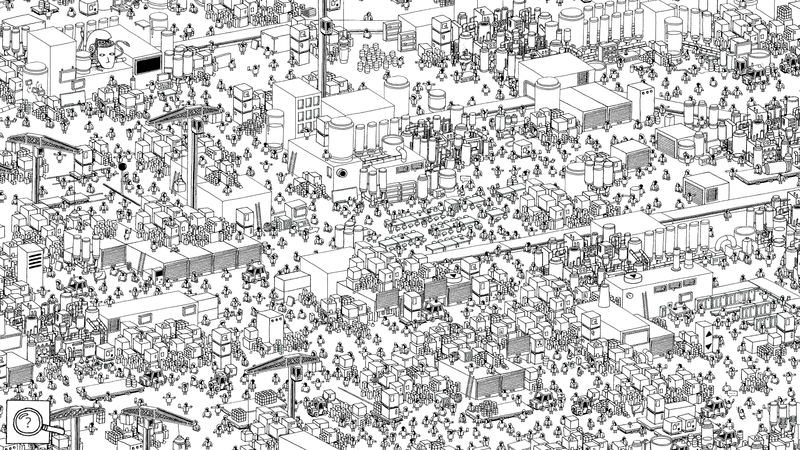 The stark aesthetic of Hidden Folks makes it seem like a giant, digital, adult coloring book. Because of this association, it seems like an inherently soothing experience. That's on purpose, according to veteran independent game designer Adriaan de Jongh. "The game won't feature any timers or quick gameplay; you'll be presented with massive illustrations, animated and wiggling and interactive and whatnot, and you can take your time exploring what's happening," he says. "We want this to be the sort of game that you pick up, play for a while... find another character, and then leave the rest of the discovering up to another play session. Slow paced, no pressure, and a lot of things to do that will wait for you." It's been a busy year for de Jongh. His independent studio, Game Oven, shut down in early 2015 after releasing a slew of innovative and acclaimed titles, including mobile ballet simulator Bounden and foreplay fodder Fingle. De Jongh didn't skip a beat after his studio's closure -- he continued to prototype new games, participate in jams, give talks and judge the Independent Games Festival. "And on top of all that, 2016 began like crazy when I was selected for Forbes' 30 under 30, after which the Dutch media world woke up and practically turned me into a Dutch celebrity," de Jongh says, laughing. "I'm really glad to be working with Sylvain Tegroeg now for Hidden Folks, and I don't think that would have happened if I were still part of Game Oven." All's well that ends well -- but de Jongh is just getting started. Hidden Folks will launch this year across iOS, tvOS and Steam (PC and Mac) for an undetermined price. De Jongh is happily working on this game and setting plenty of other development goals for himself in 2016. He doesn't plan on stopping any time soon. "Man, I absolutely love making games," he says.